In this article, David M. Dilts from the Oregon Health and Science University, offers the opinion that cancer research in the United States has been presented with early warning signals of potential future problems. 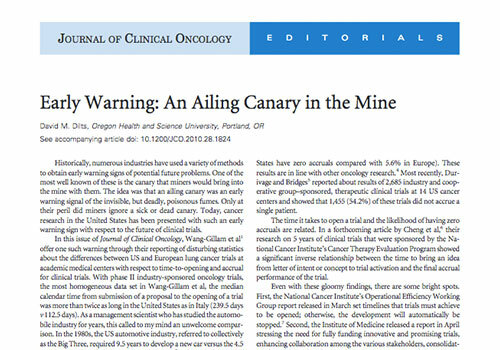 In this article, David M. Dilts from the Oregon Health and Science University, offers the opinion that cancer research in the United States has been presented with early warning signals of potential future problems and draws an unwelcome comparison to the US automotive industry in the 1980s that faced higher quality and lower cost competition from Japanese car manufacturers. He points to recommendations from two industry reports that, if adopted, will make major strides in the much-needed re-engineering of the clinical trial system. Read the full article here.